My Great Great Grandfather was George Macleman of "Rose Cottge", Avoch, born 1855, son of Donald Macleman and Isabelle or Isabella Patience. George moved to Lanarkshire, Scotland sometime before his marriage to Annie Barrie in 1876. 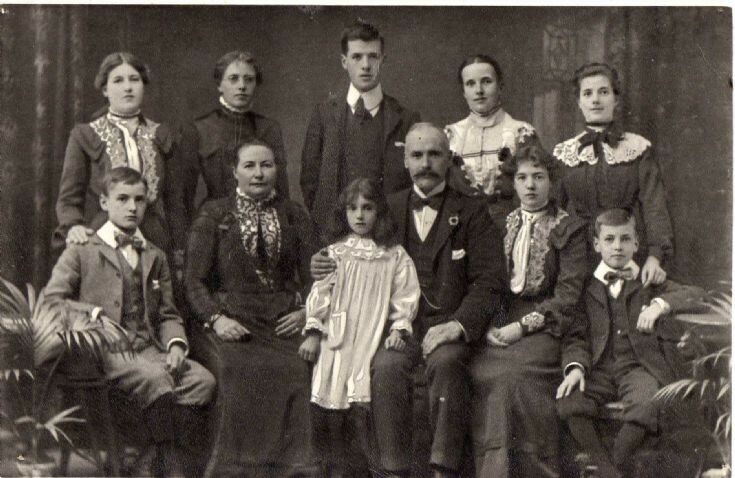 This is a picture of my great grandmother Helen Mason McClymont's Family taken in Lanarkshire, Scotland sometime between 1897 and 1902. The parents are Annie (nee Barrie)(born 1857)and George McClymont (Born 1855) previously known as Macleman. If anyone wishes to help me fill in the blanks I would be most grateful! Hello Helen, I would love to get in touch with you. I live in Deception Bay Australia and I have a great number of Macleman/ McLeman records from Avoch. I am very happy to give you any you need. An admin person mentioned you live not too far from me. I'm not sure if you can access my email address from this page but you are welcome to contact me. Let me know if you need me to send it. I posted earlier this morning here and on the Cromarty Archive under the impression you lived in Australia. If you live in the U.K please disregard that in one of the postings I invited you to visit me to see if any of my records were from your branch of the family. I certainly think that would be a long trip if you're in the U.K. I now have more information about where our Maclemans lived in Avoch. I understand Rose Cottage to have been at 24 Dock. Does this ring a bell for anyone? In Particular, does anyone have a picture that they could share? I currently live in Rose Cottage in Rose Street, Avoch. I wonder if this is the same Rose Cottage you speak of? I have done some digging and 24 Dock is now known as Kenya Cottage. Thank you for that information. Is 24 Dock also in Rose street? According to Google maps it is, but the street view is very limited.Apparently at 22 Dock is Beronia cottage, and former inhabitants from there told me that Rose cottage was at 24 dock.As long as 'Kenya Cottage'is in former Seatown,then this should be the correct one.Do you have a picture of 'Kenya Cottage' that you might be willing to scan and send to me or post on this site? If you know the names of former owners from local lore,I would also love to have that information- if it does not trouble you to find out.I would be most grateful!Thank you. My family lived at 22 Dock, it was knocked down. I will look through my images of Dock and see what I can find. Hi John, I have had a look at the photos, but I'm not sure which photo you refer to. What is in the photo? If you look in Albums there is a old map of Dock, 22 is outlined in grey and 24 is numbered. Did I send you some photo's by direct e-mail? Thanks John, I'll have a look. No, I didn't receive any pictures. I am interested in the comments on Rose Cottage Rose St Avoch. I don't think you are talking about the Rose Cottage in Rose St that was the home of the Mackenzie family from 1891 until the last member of the family to live there. Jean McLennan who died in 1995. My gt grandfather Donald Mackenzie built Rose Cottage & he lived there with his wife Isabel nee Fraser & their six children, David 1883, James1886 , Janet1888, William 1891(my grandfather) Margaret 1896 & Donald 1901(Tom). I have been researching my family for 40 years & have a lot of information of the Mackenzie's of Rose Cottage. I also have photographs of the house & the Mackenzie family. Why not scan and send some of your photographs and we can put them on the site. Jane Hall, I now live at Donald Mckenzie's Rose Cottage and would love to see some photos. Thanks for your info Jane. I'm sure that there was another 'Rose cottage' in Avoch ( ' Och' as my great Aunt Elisabeth Fleming, nee McClymont, used to call it.) my great great grandfather George McClymont, originally George McLemon, left Och for the Glasgow weaving industry some time before 1876, we think. Aunt Elisabeth told my mother that she used to go back regularly to Och to visit family there, and my mother understood that it was Rose Cottage that had been the original family home. Their home in Blantyre , Glasgow, was named RoseAvoch in memory of George's childhood home. Does this ring a bell for any one? For Jane Hall. We own 10Rose Street, next door to your great grandfather's house. My father started to serve his time as a carpenter and coffin maker with your grandfather before he went to sea. There used to be an old house in front of our place and your great grandfather, known by the way, was Donald Skitrock, had his workplace at the back of it . I remember twin girls climbing on the rof of that old house. They must have been relations of yours. janet, Mrs Crabtree gave me and my mother a whole load of Needlewoman magazines which I still have. i remember her telling us how she met Mr Crabtree on a cruise ship. Her sister Maggie wasn't nearly as pleasant! They used to have an ebony elephant in the passage and if the dor was open, we used to go and sit onit! Just a few memories for you. Thank you so much for your information about Rose cottage & Janet Crabtree. Janet was my great aunt . My grandfather was Janet's brother William who became a doctor, William had three children. James My father William & Jean. Jean was the mother of the twin girls Sue & Gay, my first cousins. My father was left Rose Cottage by Janet as a holiday house however we lived in Kent and it was not possible to travel to Scotland to use it. The days before Easy Jet. My father's sister Jean brought it from him & lived there until 1995 when she died. I do hope to come uo to Avoch in the not too distant future. Would be interested in any information re William McClymont(originally McLeman) born 1847 Avoch and married Jessie Stewart born 1848 also from Avoch. They came to NZ sometime before 1877. Why did the name get changed from McLeman to McClymont?? My grandfather Donald McLeman lived in Blantyre when he first got married I wonder if he was in contact with your family at that time. He married in 1911. My name is Jean Barry Hobbs. I was supposed to be named after my grandmother who I believe is the little girl in the picture. My mother was Ellice Upton Nora Iorns, Nana married a Joseph Irons. I remember talk of Jemima and Annie and visited them as a small child. Would you like to get in touch? I live in N.Z. Nana lived to 103! I live in N.Z. and the small girl in the front Jane, Jeanie, was my grandmother. She died aged 103. You may like to contact me if you would like to know her history.